And now, the amazing conclusion to this series of posts on Neil Calkin and Herbert Wilf’s paper, Recounting the Rationals, and the answers to all the questions about the hyperbinary sequence. Hold on to your hats! That’s right, it’s the hyperbinary sequence! In particular, the numerators are the hyperbinary sequence starting at index 0, and the denominators follow the same sequence, offset by one. …but why?! 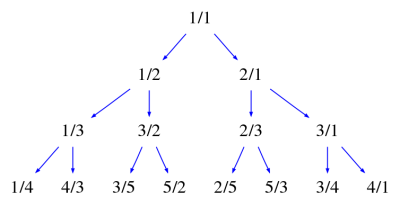 The Calkin-Wilf tree is defined by a recursive rule for manipulating fractions, and the hyperbinary sequence is defined in terms of ways to write numbers as sums of powers of two… it certainly isn’t a priori obvious why these should have anything to do with each other! Now, what do you notice about the relationship between the label on a node and the labels on its children? It’s not too hard to guess the pattern: the left child of the node labelled is labelled , and the right child is labelled . How can we prove this? Well, it’s certainly true for the root note: it’s labelled 1, and its children are labelled 2 and 3. Now we note that if the pattern holds for the node immediately preceding node —that is, the children of node are and —then the children of node come immediately after the children of , so they are numbered and . If you think about it, this is true regardless of whether and are on the same level, or is the end of one level and is the beginning of the next. 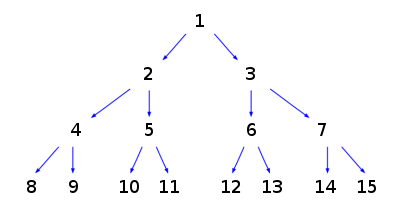 We can think of labelling each edge of the Calkin-Wilf tree with either a 0 or a 1: 0 for left edges, and 1 for right edges. Then taking all the zeros and ones along the path from the root to any node and sticking an extra 1 at the beginning gives us the label of that node in binary! For example, the path that goes left, left, right corresponds to 0, 0, 1, and adding an extra 1 to the front gives us 1001–which is indeed the binary representation of 9! As pointed out by JM, this connection with the Calkin-Wilf tree is exactly what we need to prove Fergal Daly’s conjecture about the number of primary occurrences of any given number. We defined a primary occurrence simply as a number at an even position in the hyperbinary sequence. Of course, even-labelled nodes in the Calkin-Wilf tree are exactly the ones which are left children, and so the primary occurrences are the denominators of left children (equivalently, the numerators of right children). Also, since left children are always of the form , left children always have denominators bigger than their numerators. Finally, as you may recall, we showed earlier that every positive rational number occurs somewhere in the Calkin-Wilf tree, in lowest terms, exactly once. Putting this all together: each primary occurrence of corresponds to a fraction in the Calkin-Wilf tree, where . And since every fraction occurs exactly once in lowest terms, there is exactly one such fraction for each positive integer which is relatively prime to . Of course, by definition, there are such numbers, so this is the proof of Fergal’s conjecture! There are exactly primary occurrences of , since that’s how many reduced fractions there are between 0 and 1 which have a denominator of . The connection with the Calkin-Wilf tree also allows us to compute —that is, given any , we can efficiently (in time) compute all the primary occurrences such that ! How does this work? Well, if you remember, the Euclidan Algorithm gives us a way to find our way up the Calkin-Wilf tree from any starting fraction. Combining this with the relationship we discovered earlier between the label on a node and the labels on its children allows us to compute the label on the node where we started. Start with the pair where is relatively prime to . Call the current pair of numbers . Given , if then write . Otherwise write . Repeat step 2 until reaching . Read off the primary occurrence of by prefixing 1 to the reverse of the binary digits written over the arrows. All of this leads to the following (somewhat mind-blowing) observation: the position of each primary occurrence of in the hyperbinary sequence is a proof (encoded in binary) that is relatively prime to the number that comes immediately before it. -- and b are not relatively prime. -- Find the primary occurrences of n.
putStr $ show i ++ ": "
On my computer this runs in about 0.03 seconds. Sweet! Note that the position of the final primary occurrence of 1000 has 303 digits–that’s approximately one centillion. I certainly wouldn’t want to go through the first one centillion numbers in the hyperbinary sequence looking for 1000 by hand, would you? I hope you’ve enjoyed this little (1.5-year-long!) excursion into the fascinating world opened up by Calkin and Wilf’s paper. (I’ve sure enjoyed writing it!) If you’re interested in exploring more, I suggest looking at Roland Backhouse and João Ferreira’s paper, Recounting the Rationals, Twice! which also explains the connection to another famous tree of fractions, the Stern-Brocot tree. If you’re interested in the computational aspect of the hyperbinary numbers, have a look at Enumerating the Rationals, by Jeremy Gibbons, David Lester, and Richard Bird. This entry was posted in arithmetic, computation, induction, iteration, number theory, pattern, proof, recursion, sequences, solutions and tagged algorithm, binary, Calkin-Wilf, Euclidean, Haskell, hyperbinary, tree. Bookmark the permalink. By the time you reached the end, I was forced to go back and reread from the beginning! Very nice job, and nice connections, throughout. Yes, in order to reach the end, I was forced to go back and reread from the beginning, too! =) Glad you enjoyed it. Very brilliant work. Really liked it.